Writer/director Geoff Redknap melds together science fiction, psychological horror, and family drama seamlessly in his feature-length directorial debut The Unseen. His story of an estranged father literally fading away as he wrestles with alcoholism and suicidal thoughts is a gripping effort bolstered by a sympathetic “monster” that harkens back to the ways that Universal Studios and Hammer Film Productions handled their classic creatures, along with top-notch performances from its cast. Bob Langmore (Aden Young) is a British Canadian sawmill worker whose reduced job hours, substance abuse, and loner lifestyle are the least of his worries — he is also beginning to disappear from sight. He tries to keep this fact hidden from the world. His ex-wife Darlene (Camille Sullivan) phones him in an effort for him to reconnect with their rebellious teenaged daughter Eva (Julia Sarah Stone), who he hasn’t seen or spoken with in eight years after he suddenly abandoned the family without explanation. This doesn’t sit well with Darlene’s current lover Moll (Alison Araya) when she finds out. Meanwhile, local drug dealer Crisby (Ben Cotton) coerces Langmore into doing a professional favor for him after Langmore’s truck breaks down that will help the estranged father reach his daughter’s home. When Langmore returns to the town from which he had thought he escaped, he finds long-repressed dangers and mysteries from his past resurfacing to haunt him in new ways. The Unseen is fraught with tension. This is no easy feat because Redknap has so much going on in his screenplay, but his pacing in direction is exceptional. Without going into spoiler territory, the science fiction elements are lo-fi but effective, and the horror facets deliver when it is time for that, as well. Bob Langmore (Aden Young) and Darlene (Camille Sullivan). The family drama is engaging and sometimes heartbreaking, and though the subplot regarding drug delivery might seem like adding on a tad more than the story really needs, the results are effective and add a bit more nail-chewing into the mix. One of the highlights of the film is an eerie walk through an abandoned section of an asylum by Eva and some of her friends. Redknap’s helming and the actors’ commitment make this brief sequence an integral one that shows both Eva’s strength and fragility while adding even more suspense and questions into the proceedings. The cast is nothing short of fantastic. Young marvellously portrays Langmore, a complex character demanding subtle shifts in development, with an alienated toughness offset by a vulnerability hidden deep inside. 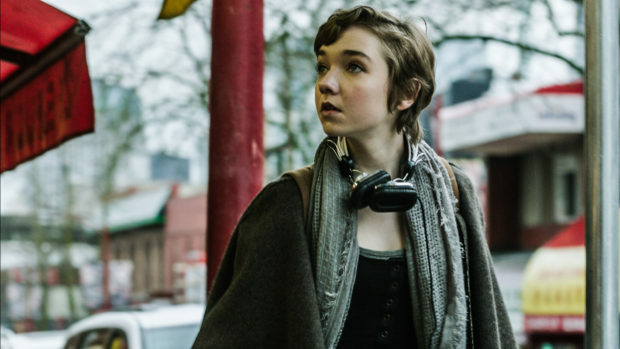 Sullivan is wonderful as Darlene, a strong, well-written character trying her best to reconnect with her daughter. Darlene is pulled between holding several fragile relationships together, and Sullivan delivers the goods in a role demanding a wide range of emotions. Stone is terrific as Eva, a fiercely independent young woman who resists authority and who is determined to uncover secrets about her family’s past. Stone gives Eva a sweetness often missing from portrayals of similar characters and, when it is time to be defiant, she nails that, too. The large supporting cast is universally sterling, as well. Julia Sarah Stone gives a fantastic performance as Langmore’s daughter, Eva, who searches for answers in dangerous places. Redknap, well known for his special effects makeup work on more than 60 film and television projects including Deadpool (2016) and such series as The X-Files and Supernatural, imbues Langmore’s slow descent into invisibility with gradual reveals of ever-more-grisly displays. Redknap gets the most from his makeup and visual effects teams as the two combine efforts and deliver striking results, from a quick, subtle glow of a television screen seen through Langmore’s shirt to far more gruesome displays. Unlike the title characters in Universal Studio’s The Invisible Man (1933) and The Invisible Man Returns (1940), Langmore’s transformation is not a physically easy nor quick one. The millworker is in constant pain with wounds that don’t heal and ever-increasing chunks of his body disappearing. 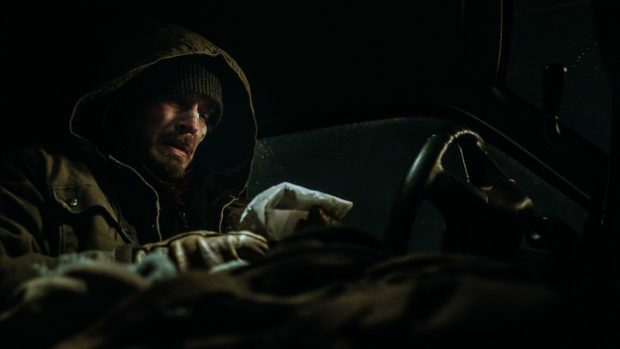 Body horror is not the main focus of The Unseen; Langmore’s physical wasting away eventually reawakens something in him emotionally and ratchets up the psychological horror aspects of the film. Redknap’s feature-length debut as a writer/director — he has scripted and helmed several short films before — establishes him as a cinematic talent who has the potential to be a genre-crossing filmmaker. The Unseen gets both its art-house science fiction–horror and indie drama approaches right, and deserves to find a wide audience. Langmore resorts to desperate measures so that he can visit his troubled daughter. The Unseen is currently on its international film festival run, with plans in the works for early summer Canadian release through Raven Banner, and UK release in late 2017. It has also been acquired for distribution in France, Australia, Germany, and Japan. More deals will be announced after the Cannes Film Festival in May.